Three days a week, volunteer members of our homecrew come to help us clean the tanks and feed our animals. With increasing frequency, our Giant Pacific Octopus Athena has eagerly greeted her volunteer by grabbing their tongs and cleaning equipment. Perhaps this is just her way of saying hello, or maybe she just knows she will be fed soon and wants to speed up the process. In researching the care and feeding of these intellegent molluscs (some researchers consider them to be about as smart as a cat) I quickly learned that most aquarists provide some sort of enrichment activity for these animals to keep them occupied. 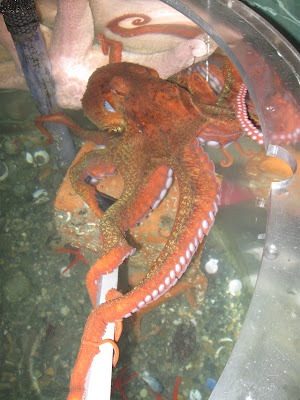 Octopuses have shown the ability to solve mazes, learn cues and remember solutions. What has puzzled scientists is that octopuses develop this intelligence during a short life span (up to 4 years) and in social isolation, rather than in complex communities like chimps, dolphins or humans. 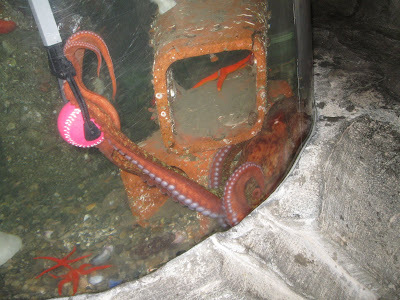 I had tried to make "crab in a bottle" puzzles for our Red Octopus before without success. Further investigation revealed the key part I was missing-- an octopus needs to smell that the toy or puzzle has food inside. Octopuses smell with their sucker discs (up to 1,800) and rubbing the outside with the food added the scent she needed to know there was a tasty smelt inside. 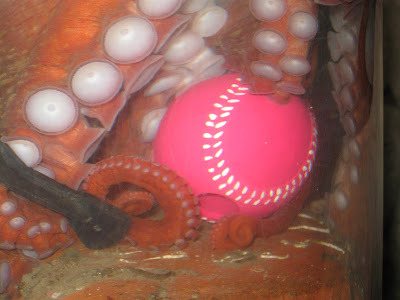 Athena explores the ball with her tentacles, but still keeps the tongs in her grip. After just a minute or two, she had emptied the ball and taken the smelt up to her mouth. The ball--no more fish inside! She held onto the ball and explored it for a few more minutes. Then she did something totally unexpected. She grabbed and ate one of the large Walleyed Pollock which had been her tankmates for over a month! She had been daintily touching the fish for a few weeks, but made no sign of attack until today. Come see Athena and our other fascinating animals when the Marine Exhibit re-opens on April 2, 2010. 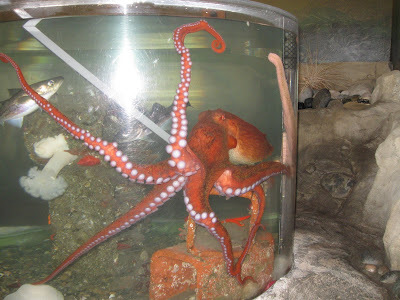 Meanwhile, we'll be working on some new octopus toys to keep her entertained. 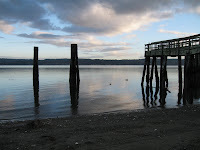 Saturday night some Citizen Science volunteers from PTMSC traveled out to Hood Canal to gather mussel samples for a NOAA project. 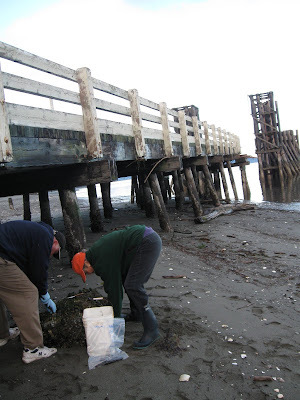 This is one of the longest contaminant monitoring program detecting changes in the marine environment since 1986. Mussels are filter feeders and a great indicator of toxins in the marine environment. 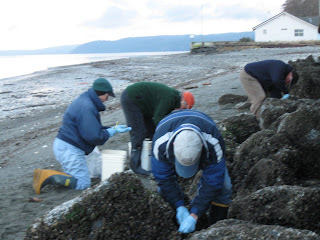 Mussel tissue can be analyzed to give researchers a snapshot of the water quality at that particular time. They are tested for over 100 chemical contaminants in the water including, PAH's (compounds formed during burning of coal, oil or gas) persistent organic compounds, chemical elements (lead, mercury, zinc), pesticides and PCB's (cooling and insulating fluids). Concentrations of these chemicals are increased by human activities and pose threats to marine environments and humans. In some locations around the United States, concentrations of harmful chemicals have been decreasing but in others there is a huge peak in chemicals present in the water. Variations between seasons have been seen with peaks present in the winter months due to runoff during the rainy season. It was a fun and interesting project to take part it and the weather even worked in our favor!